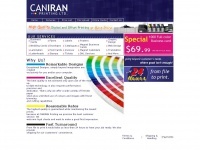 Caniran Printing Ltd. offers high quality digital and offset printing services, in Toronto, North York area. If you are looking to design and print any kind of business cards, brochure, letterhead, gift cards, flyers, ... you are in right place, just give us a call. The web server used by Caniran.ca is located near the city of Markham, Canada and is run by Cirrus Tech.. This web server runs a few other websites, mostly in the english language. The websites of Caniran.ca are hosted by a Nginx server and were developed in the programming language PHP. The content management system WordPress in the version 4.9.6 is used. The HTML pages were created with the latest standard HTML 5. Both the inclusion of the website in search engines and follwoing of its hyperlinks is explicitly allowed.